Kerala has banned plastic bags from this month. It’s not a blanket ban, as only bags below 30 microns are banned – in hotels, hospitals and all retail stores. Kerala however is not the first state in India to ban plastic bags. Sikkim did it quite some time ago and what is admirable is that the ban is working. Sikkim did it even though the state never had as bad a problem as the rest of the country. Maharashtra’s experience is indicative of the situation in the rest of the country. After the July 2005 floods in Mumbai (drains had got choked which led to flooding during heavy rains) it was decided to ban plastic bags. Did this last? Oh no, the plastic lobby worked overtime and got the ban revoked. And soon the blanket ban was converted to a ban on bags below 50 microns and a dimension not less than 8 x 12 inches. The whole route through the jungle was spewn with plastic waste of casual thrill seekers and locals alike – with plastic from biscuit packets, balaji wafers, Lays packs and mostly with gutka and zarda packs like the Goa1000. Worse, at a few places there were broken beer bottles (people have gotten drunk and drowned there). 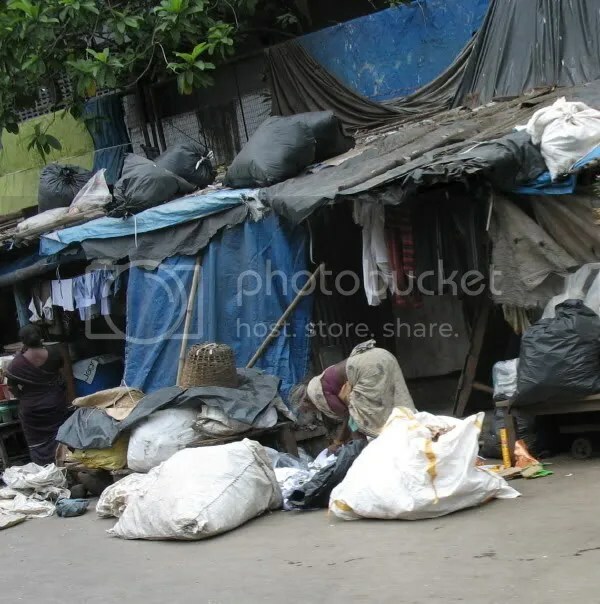 The West Bengal government imposed a ban on the manufacture, sale and use of plastic bags less than 40 microns in thickness in June this year, but the bags are already back on the streets! Tamil Nadu plans to ban plastic bags too (a blanket ban is proposed). The blanket ban idea makes perfect sense as it is easy to get round a thickness ban…manufacturers simply make slightly thicker plastic bags. 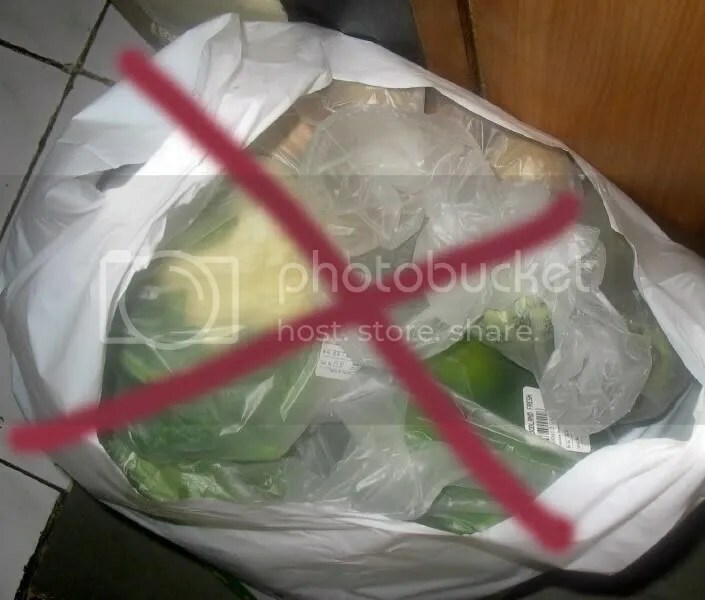 The Indian government for example has banned shopping bags made of a thickness of less than 20 microns and manufacturers get away by making plastic bags of 21 microns! It doesn’t solve the problem…that of plastic proliferation. The economic angle is very important here. In India recycling is all about economics, while in the west plastics recycling has everything to do with saving the environment. Perhaps that is why recycling works better here than in the US, where less than 5 percent of the 100 billion bags used each year are recycled. In London, out of the 1.6 billion plastic bags that are used annually, only one in 200 is recycled. In France, hardly 4 percent of the three million tonnes of plastics discarded annually is recycled. India recycles about 40-80 per cent of all plastics produced. Ragpickers (the majority are women and children) do the job by digging into the wastebins with their bare hands. They sell the stuff they have sorted out to eke out a living. In Taiwan presently one has to pay for plastic bags, but this is set to change as Taiwan is planning to ban plastic bags altogether as also disposable plastic plates, cups and cutlery used by fast food vendors. In Ireland one has to pay for a plastic bag and this extra charge has led to a 90 percent drop in usage! In Australia “green bags” costing a few dollars are available and towns like Coles Bay and Huskisson have banned plastic bags. In France there is a huge movement to promote the use of eco-friendly bags. Plastic bags will be banned in Paris later this year anyway, and by 2010 there will be a ban all over France. Bangladesh too has imposed a ban, but I do not know if this is working. 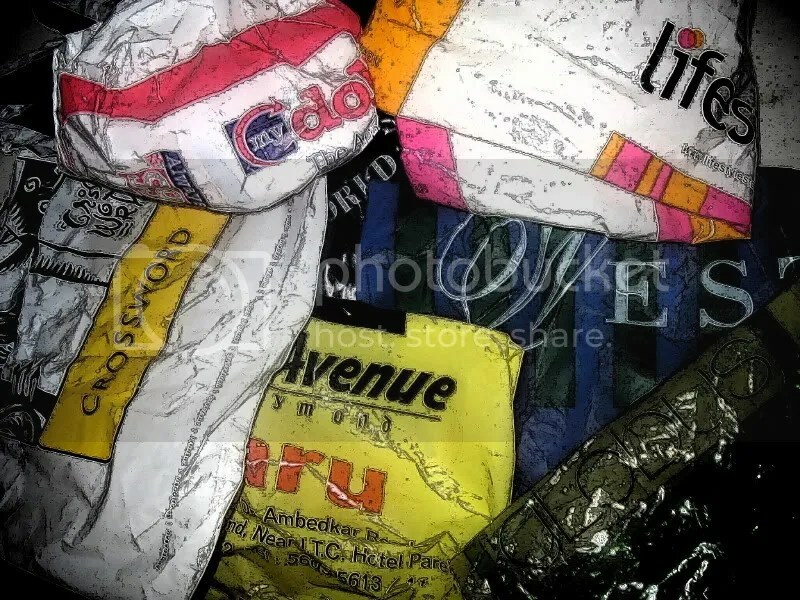 In Uganda, a ban on plastic shopping bags has been imposed recently, but the people aren’t listening! 2007: World consumption of plastic is 100 million tons, but in the 1950s it was just 3 million tons. In 2004 global consumption of bottled water alone was 154 billion liters. More than 1 million birds and 100,000 marine mammals perish each year by either eating plastic waste or becoming trapped in it. Plastic could take 500-1,000 years to break down. Plastic waste in India is about 4.5 million tons a year. There is already a strong global movement to ban plastic as it can cause damage, not just to the environment but also human beings. I think many countries are getting their act together. Unfortunately the urban rich are changing their frugal habits and embracing a brand new throwaway culture. It’s sad because the west has realised it’s mistake and they will be fixing things while we in India could get from bad to worse. The only thing that will work in India is if customers have to pay heavily for plastic bags. Rs 10/- extra won’t work with the new rich…I think a minimum of Rs 50/- for just one big thick plastic bag should do the job. As for the smaller ones, Rs 25/- should be the minimum. If the demand drops there is hope. Finally, it’s what the people want. If they want the bags there will always be unscrupulous people willing to provide them. The fines for companies are just Rs 5000/- and if a small bribe is given even this amount need not be paid. Nita, the reasons in the US are not just the environment – there is some financial benefit for suppling plastic to the industries that recycle them into new products. I’d think that the costs of cleanup associated with not recycling also play a role, but will have to do some research before being certain about it. So, it’s a mix of environmental and economic issues and the two are generally linked, though aam janta in the US probably does it more for the environmental reason. You wrote a very well-researched and detailed article Nita. yes i had realised that mistake about the link..,and in fact have rectified it. Thanks to you too for your detailed post on what is happening in the US. or Reduce using by Re-using it atleast. As an induvidual – “Not Me” shall be the first step & it starts at Home. Take a bag out when go for shopping and Say no to plastic when shopkeeper gives it. I think that’s simple way when one plans shopping really well. Rs 50/- fine not a bad Idea. Bharath, Although I do it at times (refuse plastic bags) it’s not the case always. I need to become more conscientious. Suburban, thanks for sharing that about Canada. Along with the plastic ban, wish the govt. would impose a fine on littering and place garbage bins in all public places so people would have a place to throw trash. Does the raddiwaala still come to pick up old newspapers and bottles etc or is he/she an endangered species? Hi wishtobeanon, the raddiwalla is very much around! 🙂 Some colonies don’t let these guys enter though but they are everywhere anyway. those little shops in small lanes. they take everything from beer bottles to any sort of plastic, even thermocol and cardboard…besides old newspapers and mags ofcourse. about bins, they keep getting stolen. even the so-called theft-proof bins. You can read about it here. Thanks for the link. Sad! I guess we cannot think about cleanliness on our streets until we get rid of poverty. This reminds me of an incident that my brother (who is a vet) mentioned. He and his colleagues operated on a sick cow, only to discover a HUGE ball of accumulated plastic bags blocking her intestines. It’s just an example of how an individual behavior of throwing away plastic bags when multiplied by many can cause unprecedented and unforeseen problems elsewhere. We should have learnt a lot form the Mumbai floods, but unfortunately that has been easily forgotten. We have got bio-dgradable plastic bags, I dont know why their use is not enforced. Perhaps they are costlier. If we stop using plastics, we should use …what? paper bags? That would involve chopping down trees and is not the politically right thing to do, besides being impractical. How would you carry your shopping purchases without it tearing the bag and falling all over the parking lot? Using jute is a good idea, but no one (including the Indians) will buy it. Don’t know much about Oemar’s biodegradable plastic bags. Sounds good. That would involve chopping down trees and is not the politically right thing to do, besides being impractical. There are also reusable plastic grocery bags that are quite tough. Why not? I would. When I go shopping, I see others who bring their own bags. Hello. I just discovered this site today. Thank you for this comprehensive summary of the issue of plastic bags throughout the world. I live in Oakland, CA and often forget about how differently people view environmental issues from state to state or even town to town, much less country to country. Wait! Are you sure that’s recyclable? A lot of materials get put into recycling bins that are ot only non-recyclable, but actually harmful to the sorting equipment. And rambodoc, we don’t have to use either paper or plastic, but cotton. In fact, I use organic cotton eco-bags. Biodegradable plastic bags are a good idea if people actually compost them. But we do need to get systems in place for that, which don’t much exist at this time as far as I know. i hate the way they have been freely used and the callousness of our people in taking them and that of shopkeepers in dumping them onto customers. Prax, I have added this link to my main post. Thanks. – Nita. Thanks to all. Amit, Arleen, Beth, Prax , Oemar and Rambodoc. Arleen thanks for that link. That site is a good read. Rambodoc there are always alternatives…where there is a will there is a way! The main thing is the intention. Beth, I will certainly check out your posts. Thanks. Oemar, yes the bio-degradable bags are more expensive. Everything finally boils down to money and consumers are expecting bags free! didnt people survive before the invention of the plastic bag? the kapdeka jhola was just fine then wasent it? Thanks for the article. I believe that there is too much plastic in the world but I also know that it is the cheapest way to package things. It has its usefulness. The problem is the dumping and landfills. In a lot of countries plastic has a cradle to cradle system. There is a machine called massmelt and a machine called stryomelt that recycles all plastics 1-7 and reduces them by 95 to 98percent. The plastic does not have to be cleaned or really separted from the general waste. This would include plastic bags and pvc, styrofoam containers etc. The material is thermally reduced without emissions. It produces a brick that has use as building material, coal replacement or diesel/heating fuel. Places that use a lot of plastic like schools and stadiums could be zero waste and help the environment by turning their plastic waste back into energy. So on the way to reduction of plastic which will take years and a lobby stronger then the oil industry there are other solutions. cheick out http://www.teampeace.com. Karen, thanks for your response. Yes turning all the plastic into energy is something the world should aim for. – Nita. I just knew about this site today, I wanna know that people doesnt know to survive without plastic? This is just one more example of tyranny. Government’s are trying to change personal behaviour to fit thier own rediculous ideology. The Green movement is the new fascism. see plastics are not the enemy for environment and anything.The proper usuage of plastic made your life easy going.if you care about environment dont drop plastics with degradable wastes.so come to your new era.so im proud to use plastics.coz im an plasstic technology student in cipet.we ppl are also ecosensitive,ecofriendly&etc. etc. Yes , U r right nikey! agreed! I am also a plastic technology student at L. D College of Engineering..and support the same view. Accidentally discovered this site, in an effort to collect ideas for my paintings on plastic (for and against). thanks all of you. I think i can fill in my bucket with quite a bit of plastic here. Thanks to Alexander Parkes, who left his invention for the generations, to be nurtured so well that it has become a part of everyone’s life, willingness is immaterial. The vet was surprised to see plastic in intestine of the cow, i wont be surprised if one day a surgeon finds it in the intestine of our kind. God help us, if we have to say… i’m loving it! Friends , Ban on the plastic bag , or use of the Plastic bags is not at all harmfull. All that it hurts is the lack of proper disposal of the used bags , reuse of the bags is the best idea! The plastic waste should be eliminated by the government by appointing the special pickers of the plastic from the heaps of the huge dumps.. I read above in a post here that , it is banned because of the drainge lines getting jam .. Yes it happens , but have U ever asked why?. 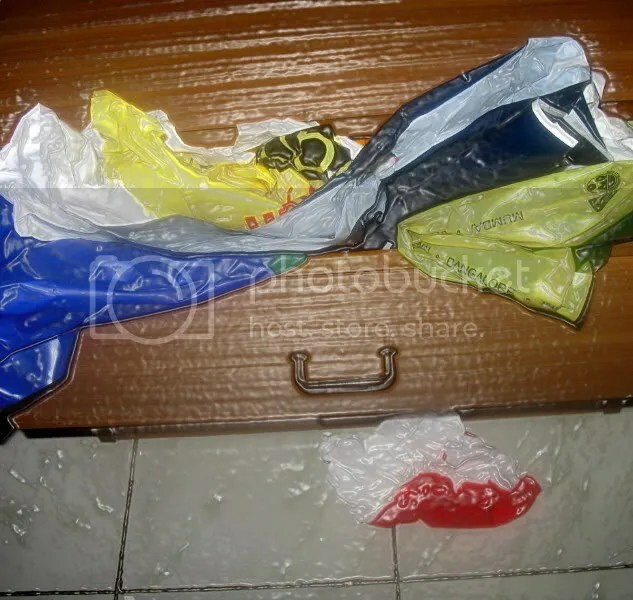 Why and how plastic bags reached those drainage passages ? Why people or say government are so careless about the plastic collection , until this bags reaches the mentioned!? Banning Plastic bags whether 30, 40, 50 microns is not advisory or say the correct way for innovation. 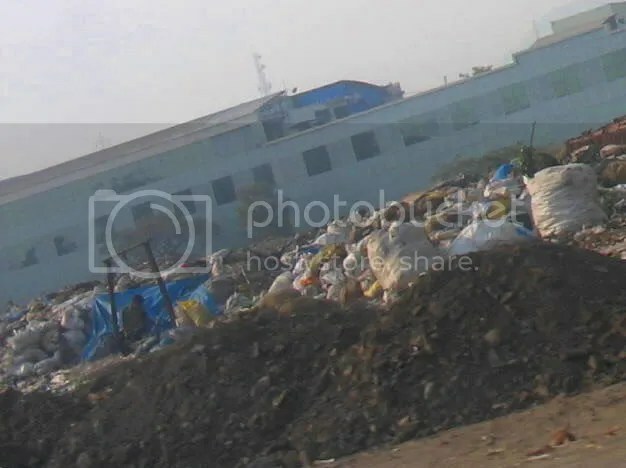 The correct way will be the isolation of the plastic bags or other plastic waste from the huge heaps of dumps and also a certain amount of the awareness among the people using bags as well..!